A generation of artists and intellectuals, including Shergill, Nandalal Bose, Abanindranath Tagore, historians Stella Kramrisch and William Dalrymple, have drawn inspiration from the caves, the oldest in the world dedicated to Buddhist wall paintings. The dramatic depletion of the key water reserves is ushering in a water crisis in the tourism town, but remains ignored by the government and tourism department. In an area already rendered critical by the Marathwada drought, this severe bout of water scarcity at the Unesco World Heritage site is threatening the bustling local tourism industry. Locals say it might not be possible for Ajanta to survive a bad monsoon this year. To top it, the cave complex has been sans water supply for over a month due to non-payment of electricity dues by the MTDC. The Ajintha Andhari Prakalp (or the Ajanta Medium Project), the reservoir with a 10 square km catchment area and the key supplier of water in the region, has completely dried up. It had water up to 40 feet until last year, but today you can stand on its ground, the water marks visible on its walls. 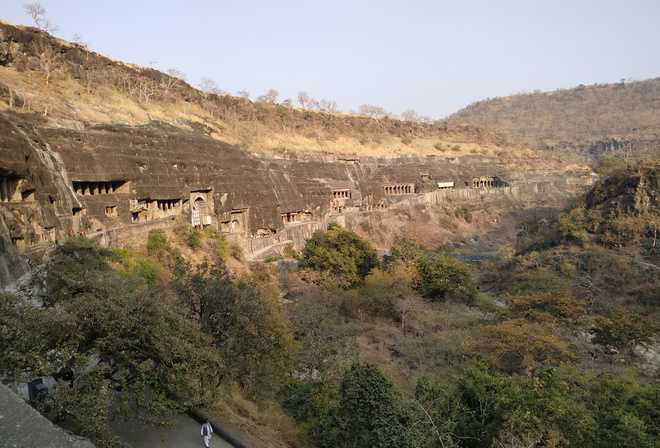 The waterfalls of the Ajanta caves, which previously flowed until March, remained dry this winter. Locals say the only recent historic reference point to this was the 1972 drought. The Sillod taluka (block), which Ajanta falls under, has 131 villages and all of them face immense water shortage. Prompted by the deepening crisis, Deepali Sanjaikhe from Ajanta, who works in Pune, organised a meeting of villagers from across the taluka to find a way to deal with the situation. “We have just cancelled reservations worth thousands because we can’t afford to keep guests without water. If something is not done immediately, even Tondapur dam will soon run out of water. Earlier Tondapur residents allowed water to flow, but now they have begun to protest. Ajanta caves too get supply from Tondapur. It’s a grave emergency which threatens tourism. The silence is scary,” she says. Ajanta, which was known for its verdant greens, has recently been in news for black marketing of water (Rs 80 per barrel). While an enquiry was marked into the same amidst mounting pressure, the administration has failed to put in an effective groundwater recharge plan in place. Arranging water from nearby reservoirs is its only plan to tackle a possible intensification of drought this year.